Fits: All Celestron 9.25 (23.5 cm) f/10 SCT versions with standard 6-32 secondary screw threads (not for CPC 925). Note 2: Knobs include a set of long spacers so they clear the secondary housing lip. 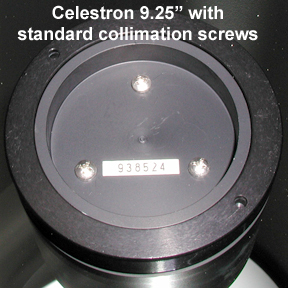 Note 3: Celestron 9.25 inch SCTs manufactured prior to 2006 have standard 6-32 collimation screws and require knobs with standard threads. These telescopes can be identified by 1) no writing inside the secondary housing (except for the serial number); and 2) most have silver factory collimation screws (photo). Do not use metric knobs on these telescopes. Note 4: A few non-CPC 9.25 inch scopes manufactured in 2006 have black Phillips factory collimation screws that aren't metric. If your scope's secondary housing looks like this, it requires knobs with standard threads. Note 5: The CPC 925 SCT requires knobs with metric threads. The CPC 925 secondary can be identified by 1) a factory-installed plastic cover over the collimation screws; 2) black Phillips factory collimation screws; and 3) brand information on the inside of the housing. Do not use these knobs on the CPC 925.